The desktop version of Google Maps added a layer that was already available in the mobile interface: a Google Buzz layer. 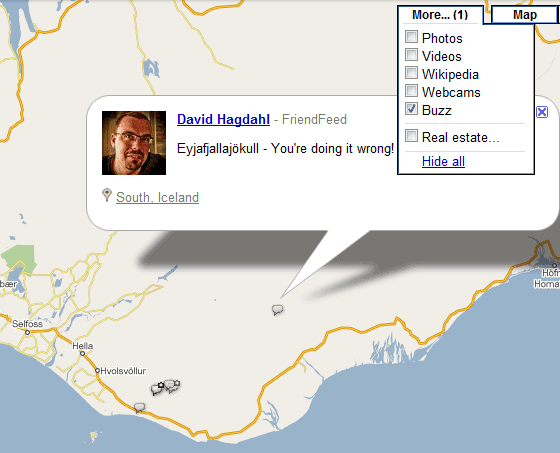 In addition to showing geotagged Google Buzz messages on the map, Google also shows posts from Twitter, FriendFeed and other similar services, so it's strange to see that the layer is called "Buzz". To enable the layer, go to Google Maps, click on the "More" tab and select "Buzz" from the list of layers. "Find an interesting area like your neighborhood and select any available icon to see what's going on there. In the post's window, click on the name to see the author's public profile, the timestamp to comment on the post, or the place to see it in Maps," suggests Google. The integration of Google Buzz's mobile app with Google Maps is probably the best feature of the application. When you post a message using the mobile application, Google uses your location to find nearby places and lets you pick one of them. 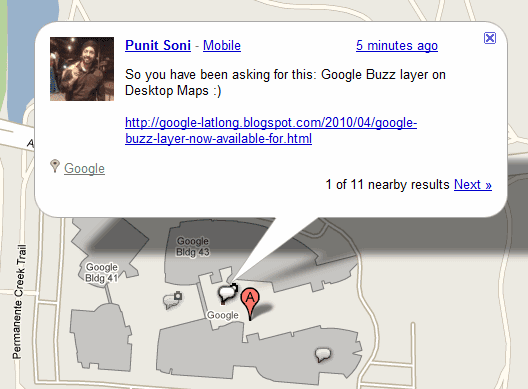 This way, Google Buzz users can post useful information about local businesses without adding a review to Google Maps. I had use this feature on my blackberry and it works great. I hope they add the "view buzz about this place" so i can see buzzes about search results. Right now it just shows the most recent ones and they fade away after 24 hours (i think). On Android I can view buzzes about places and see all the older previous buzzes. As a iPhone user I find the service dailyplaces.net much better implemented. New York Times App for Android?